no do I have a question voor you if you can tel me how i can make the joystick inputs to outputs. what poke i must type in to the computer program (if you have a example will make that very happy). and also for the cartrige and the interface connection. i sa that you youse it for your eprom programmer zo if you have a exampel of the program that i must have. Welcome and thanks for join us. Oh! this topic is too much exciting to me. Like you, I love model train too (I have a couple of sets over here), so for years I have in mind the same you are thinking. Well, using both joysticks as outputs you can drive without not much trouble up to eight devices. To drive a mini lamp or relay just fit a transistor between the Atari and what you want to drive. Both ports are controled by the adress 54018. Normally set at poke 54018,60 for all inputs. To change to all as outputs just poke 54018,43. To send data to the port POKE 54016,DATA. Now, if you want to activate two or more devices, just make a simple add. So, how you can see, that's it's too much easy. This circuit drive leds, just leds. On this one I using a 74LS245 chip between the Atari and the "real world". RVcc depends on the relay do you have. The most populars are from 12V coils. If you using this one, the power (RVcc) must be 12V. Right? With this method you don't need any cartridge interfase, just the both joysticks ports. Any doubt or question please do it. I happily answer to you. WARNING! do not short or mix 5Vcc from the Atari and 12Vcc (RVcc) of the relay!!!! Be extremely careful with that cuestion. If you mess around, your Atari must fried in a microsecond! Thanks for the quick respons now it is up to me to make it all working. i will sure ask you some more because i want to have some inputs in return if it is possible and more outputs. that is where i want to use the cardrige or the serial bus at the back of the atari. and i want to no howe i can make de eprom writer/reader so i can make some prints. but first i will make the relay outputs. Denijs escribió: Thanks for the quick respons now it is up to me to make it all working. Yeah! try with the relays first. About your other request.... well, I really don't know yet how much you know about this kind of electronic projects. So, I'm a little scary, because when using the cartridge port or parallel port the chances of burning the Atari are increasing exponentially. You really have to be aware of that! 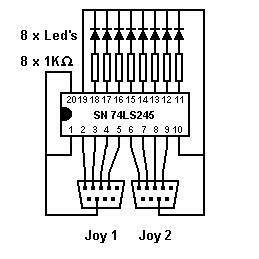 Now, go with the relays outputs (through the joystick ports) and later, if you have success with that, with pleasure, I will help you in more complex things. PD: you are Dutch? maybe German? I 'am Dutch (the Netherlands) I live in de town Heerhugowaard. Denijs escribió: I 'am Dutch (the Netherlands) I live in de town Heerhugowaard. I knew it! Because the way you write. By the way, I'd love go to Holland... see some windmills round and round must be cool.